The Southern Poverty Law Center classifies the Oath Keepers as an extremist anti-government group. A screenshot from a news report that aired on CBS SF Bay Area showed an Oath Keepers Booth at an Urban Shield event. 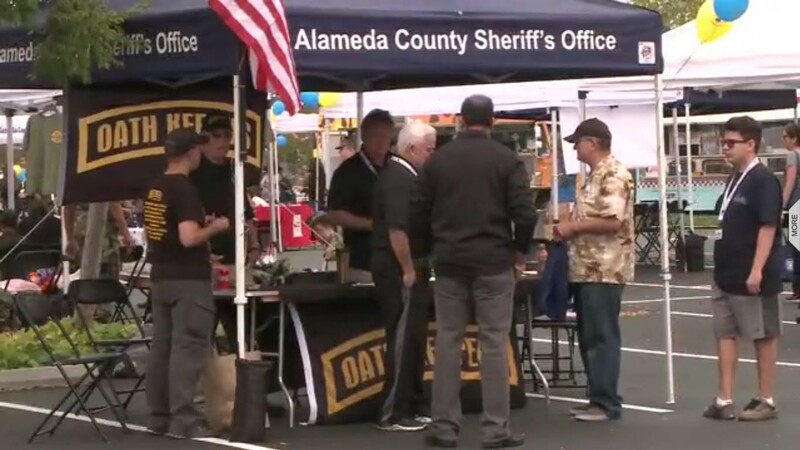 The Oath Keepers, a right-wing extremist group, held a booth at the Alameda County Sheriff’s Office’s Urban Shield training program last week to “explain who they are,” according to an Oath Keepers spokesperson. In the past, members of the organization have been involved in several confrontations with the federal government over public land and have also shown up heavily armed at Black Lives Matter protests, according to the Southern Poverty Law Center. The appearance of the Oath Keeper’s booth at Urban Shield comes amid allegations from Bay Area activists that the training program for law enforcement and first-responders promotes police militarization and racialized police violence. In Berkeley, the city council’s June decision to continue participation in Urban Shield resulted in protests and two arrests. Tracy Rosenberg, executive director of Media Alliance, a group that advocates against Urban Shield, said she saw a double standard in the fact that the Urban Shield training program, which has described itself as a “terrorism training exercise,” would allow an extremist group to have a booth there. “This double standard reinforces biases that have been documented in law enforcement about who gets stopped, who gets violently encountered with, and who gets killed,” Rosenberg said. The Oath Keepers booth was set up at Urban Shield’s disaster preparedness fair, which was open to the public and held in the parking lot of a church in Castro Valley. About 800 people attended the disaster preparedness event, and about 8,000 were involved with Urban Shield as a whole over the weekend, according to Alameda County Sheriff’s Office spokesperson Sgt. Ray Kelly. Kelly stressed that any community member can register to attend or have a booth at Urban Shield, but was unsure if the Oath Keepers had officially registered to have a booth or had set one up on their own at the event. He added that the Alameda County Sheriff’s Office didn’t differentiate between the Oath Keepers or any other group that came to Urban Shield.